not round slight rugby ball-shaped, 2 very slightly above 1 in the middle. took the shape of a large box-like jellyfish! boundaries of the bright light surround. outside edge was still a bright white colour. all drawn here exactly what they looked liked. happened very low; there was no moon and no stars visible. light seemed to tinge blue as it was so bright. This all happened in a few minutes at 10.30pm 18/9/2018. I thought to myself wow did that really happen? but I remember everything! drawing. as testament to what had just happened. a bright white surround once the 3 oval lights morphed into that shape. I will never forget that night that I'm very sure! 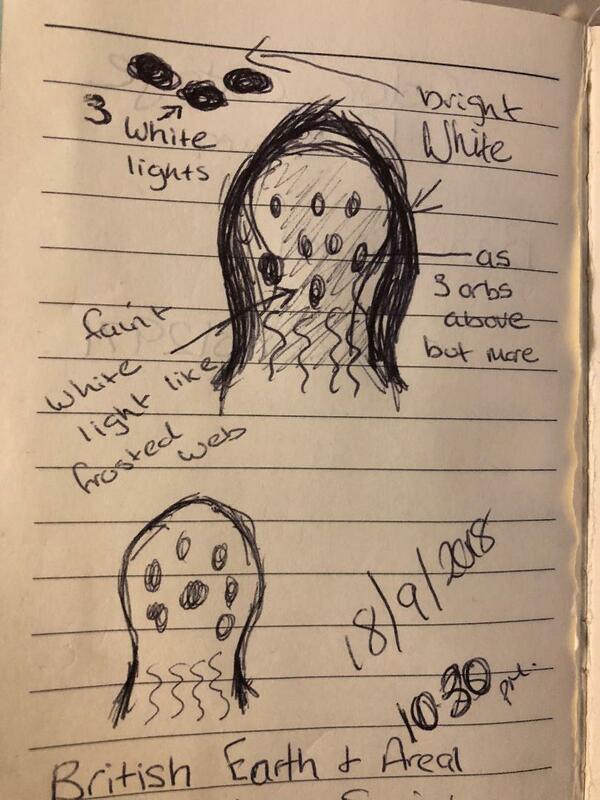 Below is a drawing that the witness made of what he saw.